Cataracts affect more than 24.4 million Americans aged 40 or older. By age 80, 61% of Hispanic Americans, 53% of black Americans, and 70% of white Americans have cataracts. There’s a good chance you or someone you love will have cataract surgery in their life. Which means you’re going to want to know what to expect with cataract eye surgery. Although it’s a fairly common surgery, having someone perform surgery on your eye is scary to many people. Many people wonder about the recovery time after a cataract procedure. To help ease your worries, we’re sharing with you information about cataract eye surgery before and after it’s performed. Keep reading to learn everything you need to know about cataract recovery. Before we get started talking about the surgery, let’s find out what a cataract is and what causes them to happen. A cataract is a clouding of your eye lens. Your lens is made of protein and water, and over time, the protein often lumps together which starts to cloud areas of your lens. As a result, it affects your vision. Cataracts can occur in one or both eyes, but cataracts cannot spread from one eye to the other. Most eye doctors believe that age is a huge determinant in who develops cataracts, although other causes such as smoking and diabetes can be contributing factors. Cataracts also affect your eye doctor’s ability to examine your eyes for other defects. While having cataract surgery is scary for some because it’s being performed on your eyes, it’s actually considered minor surgery. That’s because it’s performed in a matter of hours, it’s considered safe, and the recovery time is minimal. Many patients can go home after fewer than two hours after the surgery is performed. During cataract surgery, the eye doctor simply removes the lens of your eye and replaces it with an artificial one. Prior to surgery, your eye doctor will determine the size, shape, and condition of your eye. While cataract surgery is considered minor surgery, it’s still your eye, and things can go wrong. If you have other health issues, especially heart-related medical conditions, you may need to take a stress test first to ensure you can handle the surgery. Feel free to ask your eye doctor as many questions as it takes for you to feel comfortable. There are a few things you should always ask your eye doctor prior to this surgery. Make sure they are aware of which medications you take. Ask if you need to avoid any of them prior to your surgery. See if you need to avoid food or beverages before the surgery. Most eye doctors will ask you not to eat or drink anything 12 hours prior to surgery. While the surgery itself often takes as little as 15 minutes to perform, be prepared to be at the eye doctor’s office longer than that. It can take 90 minutes or longer to feel well enough to travel afterward. There’s a good chance your prescription will change after the surgery. Some patients find they no longer need prescription glasses to see at a distance. Ask your eye doctor if he or she thinks your prescription will change. 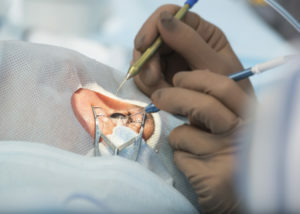 Many people have their procedure performed at a eye doctor’s clinic, but some may be completed at a hospital. Make sure you know exactly where your surgery is going to be performed and allow plenty of time for traffic, parking and check-in. When you’re in recovery, you’ll be prescribed special antibiotic eye drops. You may also be prescribed drops to relieve pain or to help with other common eye issues. Check with your insurance company to ensure they’re going to cover most or all of the cost of the prescription drugs. While cataract surgery isn’t major, it’s still surgery. When you leave, the eye you had surgery on will be covered and bandaged. You may also feel a bit woozy or drowsy. Do not expect to be able to drive home by yourself. Instead, bring someone with you who can help you pick up your prescriptions and get you home safely. Wait to drive until your eye doctor says it’s safe for you to resume driving. While you may have one good eye, it will take a little while for both eyes to adjust to the changes. During the procedure, you’ll be awake and aware of what’s happening. While this sounds scary, the eye doctor will numb your eye by administering drops. Yes, it may feel weird as the eye doctor removes and replaces your lens, but there is generally no pain involved. If you feel as though you may be too nervous, ask your eye doctor to give you something to help calm you. Another way to help calm your nerves is to take long, slow, deep breaths. Focusing on your breathing will help you feel calmer and will also distract you from what’s happening with your eye. Don’t expect to begin seeing perfectly immediately after surgery. Your eye will need a few days to adjust. Expect that your vision will be distorted for at least a few days and you may not be able to open your eye fully for several hours after you take off the bandage. While you shouldn’t feel any pain, you may feel some discomfort. It’s not uncommon for your eye to feel itchy, dry, or just uncomfortable for a while. Do NOT scratch or rub your eyes until your eye doctor gives you the okay to do so. To help you avoid scratching or rubbing, your eye doctor will most likely give you an eye patch. It’s also not uncommon to start seeing what’s known as “floaters” after your surgery. These are little black specks in your eye and they’re totally normal. Tell your eye doctor about them, but do not worry. They aren’t harmful, though they may take several months before they disappear. Remember to take your medications as directed. Do not stop taking your medications even if you think your eye is feeling better. It will help speed up your recovery time. After a few days, your eyes should begin to adjust and heal. If you have other eye issues, such as a wandering eye, it may take longer for you to heal. Be patient and continue following your eye doctor’s directions. Your eye doctor will ask you to make follow-up appointments a few days after surgery to check out your eye to see how it’s healing. He or she will then ask you to make follow up appointments for the next week and even for a few months after your surgery. Remember that even though it was minor surgery, it’s still surgery. Your eye doctor will ask you to avoid certain activities for at least the first week. Activities like lifting heavy items over 25 pounds and strenuous bending or exercising are prohibited. Any activity that may stress out your eye while it heals needs to be avoided. You’ll also need to avoid getting water into your eye for the first week, as it can cause an infection. You can wear your eye patch while showering or bathing, but if that’s too uncomfortable, just keep the eye that’s healing closed. Avoid swimming and entering hot tubs for at least the first two weeks. Lastly, avoid situations where dirt, dust, or grime can get into your eye. These irritants can cause an infection. Recovery time should be about resting, not deep cleaning. Cataracts are the leading cause of blindness in America. While it can’t be totally avoided in every case, there are steps you can take to help prevent cataracts. We keep hearing that we are what we eat, and yet, the rising obesity rates are telling us that not as many Americans are paying attention to this fact. Eating a healthy diet rich in vitamins A and C can help prevent cataracts. Lutein and zeaxanthin are also great vitamins to keep your eyes healthy. Foods such as tomatoes, berries, citrus fruits, brussel sprouts, and potatoes all contain vitamin C, which is good for eye health. Nuts, sunflowers, and green veggies like spinach and broccoli are good sources of vitamin E.
Foods like eggs and leafy greens contain lutein and zeaxanthin. Five servings of fruits and veggies each day should be enough to keep you healthy. You can also take these vitamins as supplements if you feel you aren’t getting enough in your diet. Always consult with your primary care physician before you begin taking supplements. When you smoke, free radicals are created in your eyes. These harmful chemicals damage the cells in your eyes. Eating foods rich in antioxidants can help fight these harmful chemicals. Smoking will kill off all the good chemicals and produce several toxins that aid in causing cataracts. If you don’t smoke, don’t start. If you do smoke, consider getting help to finally quit, as smoking does far more damage to your body than just your eyes. Ultraviolet light can change and damage your eyes. Wearing sunglasses will not only make you look cool, but they’ll also help reduce your risk of cataracts and other unwanted changes to your eyes. Look for sunglasses that block out between 99% and 100% of all UVA and UVB rays. Make sure your cool shades can block out 75% to 90% of visible light. A gray tint will help you see better when driving. Make sure they fit your face shape. This will not only make you look better, but a frame that’s close to your eyes and fits properly will ensure you receive proper coverage and protection. As we’ve mentioned, diabetes is a contributing factor to cataracts. It’s important to keep your blood sugar level under control if you suffer from this disease. This is because your lens swells when your blood sugar is too high for too long. Also, your lens can change the blood sugar into sorbitol. When sorbitol collects in the lens of your eye, it distorts your vision and may cause a cataract to form. Maintaining a healthy diet and getting regular exercise can help reduce your odds of getting cataracts. One very easy way to help prevent cataracts is to visit your eye doctor regularly. She or he can spot potential problems early on. For those between the ages of 40 and 64, a complete exam should be performed every two years. This includes having your doctor dilate your pupils. For those aged 65 and older, a full eye exam every one or two years is best to ensure your eyes are healthy. If you have problems with your eyes or are prone to disease, your eye doctor may recommend more frequent visits. Even though cataract surgery is considered minor, it shouldn’t be taken lightly. To ensure you know exactly what to expect with cataract eye surgery, make sure you find an eye surgeon you like and trust. Don’t be afraid to ask questions until you’re comfortable with having the procedure. Ask for help if you suffer from anxiety. Don’t wait to get the vision you deserve. Schedule your appointment with Magruder Eye Institute today.